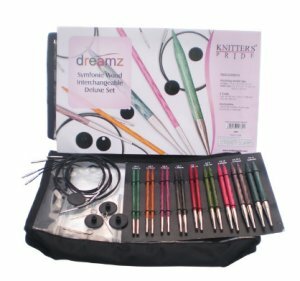 Set of 9 pairs of interchangeable needles in sizes US 4, 5, 6, 7, 8, 9, 10, 10.5, 11. Includes 4 cords: one each of 24 and 40, and two cords of 32. One set of ID tags, 8 end caps, 5 cord keys and one cord case. Easy to connect cord with a smooth join that enables stitches to glide easily - no snag! Resilient, flexible cords lay flat, with no kink or twist making them easy to store.